I am lucky enough to count Rose Levy Beranbaum, the esteemed cookbook author and baker, as a very good friend. This is the story that brought us together. 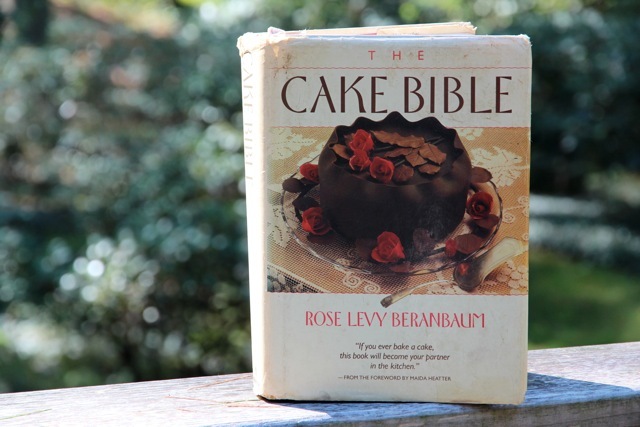 Rose’s book, The Cake Bible, was a reference that I turned to again and again. I bought it as soon as it came out and spent hours reading it, in turns from front to back, as well as flipping to specific sections as the spirit moved me. I was in awe of her talent and knowledge and always found inspiration between its covers. I was working at The Black Sheep Deli & Bakery in Amherst at the time and Nick, the owner, was generous with his time and paychecks. I learned on-the-job thanks to Nick. I knew how to bake quite well when I helped him open the store, but he allowed me to experiment to my heart’s content, which was quite valuable to a curious baker, such as myself. One day in early fall I decided to make the Chocolate Pine Cone cake in The Cake Bible. This was a complicated affair, just the kind of experimentation I loved. It was the kind of project that I was satisfied to create once, and then, knowing I could make it, never need to make again; I would be on to the next thing. The cake part was simple enough, but the decoration that made it look like a pinecone was tedious. Rose suggested that you take a small icing spatula, dip it into tempered chocolate, and dab it gently on a parchment lined baking sheet, “pressing lightly down to form a tapered petal shape”. Dozens and dozens of these had to be made, slowly, one at a time. 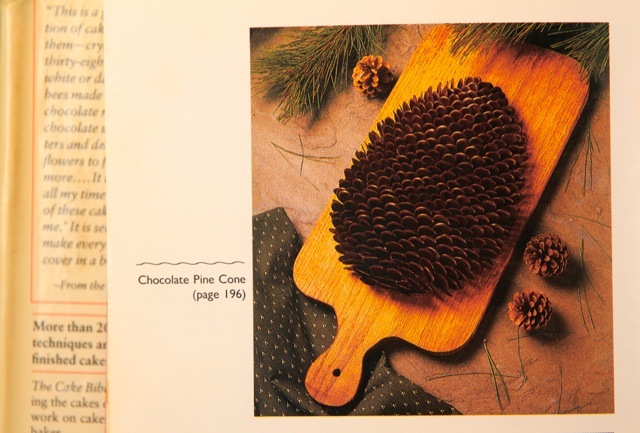 After they firmed up, each one of these chocolate ovals would be inserted into the cake, creating the rows and rows of scale-like “leaves” that give the pinecone its classic, “woody” look. I placed the finished pinecone cake in the bakery case and Nick asked me how much we should charge. “A lot,” I said, knowing all the labor that went into it. Despite the high price tag, it was purchased, and unbeknownst to me, some front-end worker took orders for more. Apparently it caught the imagination of the customers, who thought it would be a great addition to their holiday table. Once I was told the orders were taken, it was too late. I had never intended to make this cake again, but now I had to fulfill the orders. Robin, one of our bakers, had a stroke of genius. She lined a sheet pan with parchment and arranged large chocolate drops, peak side up, on the pan, all spaced apart equally. She placed it in a warm oven for a minute or two, just until the chips became warmed through. Then, she quickly dropped the pan, so that the bottom of the pan hit the floor from a few feet up. The force made the chocolate drops flatten and slide into perfect oval shapes. Dozens could be made quite easily and all at once. We now had an assembly-line approach that facilitated making the cake. About a year later, I was organizing a fundraiser, Books & Cooks, which benefited the local United Way office. We would bring cookbook authors to Northampton, MA for an evening where local chefs would prepare the author’s recipes and the event would unfold at a hotel banquet hall. The paying guests would get to eat the food, buy the books and meet the authors, who would sign and personalize the books. We invited Rose. The event was a success and raised a nice amount for the charity. Of course it didn’t hurt matters that Julia Child came as well. Being a graduate of Smith College, she was thrilled to come back to her old stomping ground. We had a post-event party, just for the chefs and the organizers. I hadn’t had an opportunity to speak with Rose privately, and this was my chance. I caught her at the right moment and started gushing about her book, and what a fan I was and proceeded to tell her about our pinecone production idea. “You made that cake?” she gasped. “You made it several times?” She looked incredulous. I recounted our procedure in detail, beginning with how it had started as a lark. How I had made it that once, never thinking I would make it again. “I’ve only made it once!” she declared. She went on to explain that her editor, Maria Guarnaschelli, had suggested during the editing process that they needed an inspirational cake, one that would make readers look at the picture again and again in awe. Rose created the cake to beef up the “wow” factor of the book. She said she couldn’t wait to try our technique and she jotted down every detail. Rose was going to try our technique! My head was spinning with joy. I knew at that moment that we would become fast friends. Since then, Rose and I have had a many a conversation, some over shared meals, some over the phone. It seems that we both share a similar level of curiosity when it comes to the kitchen and we never run out of things to chit chat about. When I had my public television show she was an invited guest numerous times, and you can see us baking together in our Videos. And that cake? Well, I have made it several times since, including miniature versions so that the tiny cakes were sized true to life (just use tinier chips); I place the small cones around a larger Bûche de Noël, where they look quite at home. The moral of this story is that even recipes in well-established cookbooks can be made your own. With an open mind and some creativity, you can make magic in the kitchen – and sometimes even streamline the process. And if you are lucky, befriend the author and make a baking ally for life. PS: The images of the book cover and Pine Cone Cake are from my own first edition copy, which is very well worn and loved.